In total, there are (in the church St. Maria de Rosario in Gerolzhofen) twelve glass paintings. Six of these originate from approx. 1440/1450 (sV) and six others from the early 20th century (nIV, nV and nVI). The glass paintings are attached hanging freely in the church space, contained in brass frames. 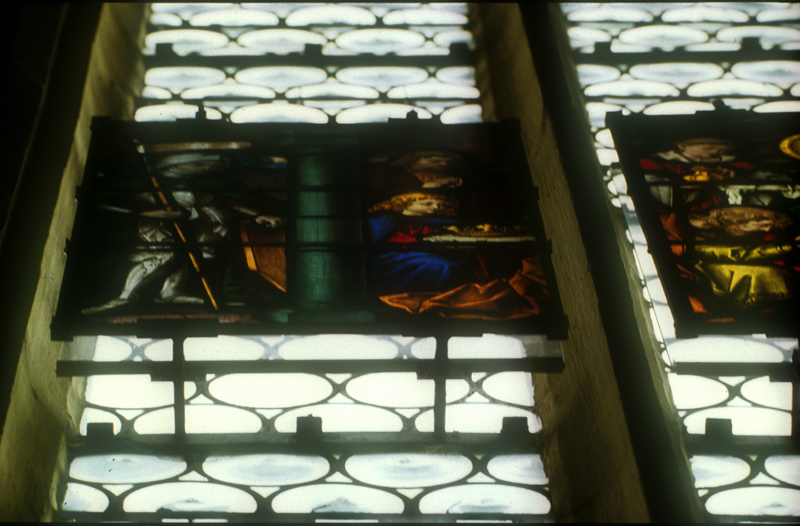 Previously, as exterior glazing, some hand-blown flashes, some round panes and hexagonal arrangements made of woodland glass were used. According to a commemorative account in celebration of the 1200-year anniversary of the founding of Gerolzhofen (in 1979), the glass paintings originate from a Würzburg school. An unusual portrayal which (in the entire history of Christian iconography) only occurs in Gerolzhofen. 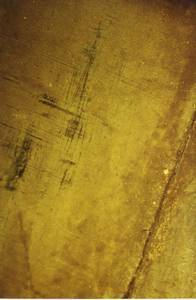 Eager to tell the story, it describes how the new construction of the church (1436 - 1479) progresses from East to West. The wooden scaffolding for the nave is attached to the finished choir loft flanked by two steeples. A worker with stones on his shoulders climbs the ladder; another mixes mortar in a vat. This rectangular town square is paved and enclosed by a wall. An image of Gerolzhofen from those days! The angel holds the Gerolzhofen coat of arms featuring the Franconian rake. * The church patron, Mary, with the Christ Child, accordig to the vision described in Revelation (12:1): ""A woman clothed in sunlight, the moon under her feet and on her head, a crown of 12 stars""."" 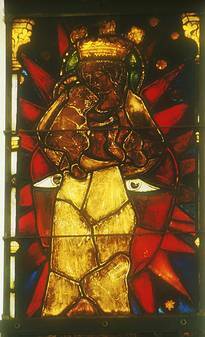 This commemorative account cites the origin of the newer glass paintings (nIV with nVI) as the early 20th century A.D. 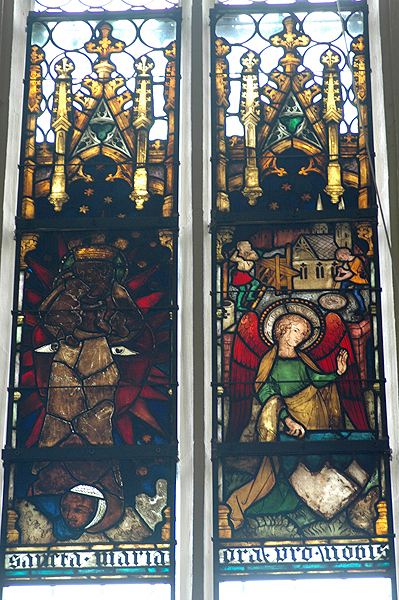 There was already a protective glazing made of leaded glass in different arrangements, as well as from different panes. To enhance these without changing the apperance of the church, additional intermediate layers were integrated into the existing restraint system. We will gladly provide further information upon request. 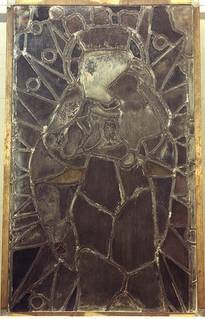 The exterior side of the medieval portrayal of the sun-crowned Madonna in reflected light displays the corrosion products typical to medieval panes. 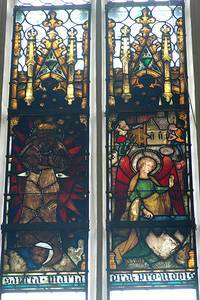 The interior in the transmitted light of the glass paintings makes the darkening due to browning recognisable. The existing leaded glass – which assumed the role of the protective glazing closing off the structural objects, was reinforced against mechanical damage by the insertion of another intermediate pane.